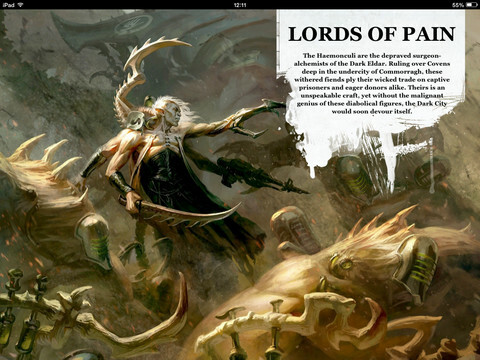 Today it’s time to take a CLOSE look… at the Covens supplement for the Dark Eldar. Hey guys, Evan from FTGT, looking at the Covens supplement for the Dark Eldar. The Warlord Traits table is also different. -First allows Talos and Cronos within 12″ of the Warlord to reroll 1s for Feel No Pain. -Second gives warlord and any Grotesque unit he joins It Will Not Die. -Third your warlord allows you to add or subtract 1 to Reserve Rolls. -Fouth, you gain D3 Victory Points if your Warlord is killed by an attack with AP2 or better or that causes Instant Death. -Fifth gives the Warlord and any Wrack unit he joins Feel No Pain (4+). -Sixth, the Warlord gets Preferred Enemy. As with previous supplements there are also supplement specific relics, called Diabolical Playthings for the Covens. First is Syndriq’s Sump, which is the same cost as a Wrack, gives the bearer a choice of special rules for each turn: Fleet, It Will Not Die, Poisoned (4+) or Rampage. Next is the Vexator Mask, also the cost of a Wrack, which, while in a challenge, reduces the Initiative of the foe by 5. The Orbs of Despair (which sounds like a horrible euphemism) is next, checking in at the cost of an Agoniser. This is a grenade that can be thrown with S1, AP2, Assault 1 Blast, Instant Death at an 8″ range. The next item on the list are the Khaidesi Haemovores, back down at the cost of a Wrack, which gives the wielder an additional D6 S3 AP- attacks in close combat at the I10 Step and DO allow additional Pile Ins. The Panacea Perverted, which is the cost of two Wracks, and gives the bearer It Will Not Die which is passed on a 4+. Additionally, the bearer is only wounded by poisoned weapons on a 6+ instead of the usual value. The final item is the Nightmare Doll, which is the cost of a Webway Portal. This item allows the bearer to add 1 to any Feel No Pain roll he makes. Additionally, the bearer can ignore the first unsaved wound that would inflict Instant Death, though the item then ceases to work for the remainder of the game. After the Relics is the Covenite Coterie Detachment, which consists of 2-6 HQ, 2-8 Elites, and 0-4 Heavy Support. Only Urien Rakarth, Haemonculi, Raiders and Venoms (as Dedicated Transports), Wracks, Grotesques, Talos, and Cronos can be taken in this detachment. The detachment, if the primary detachment, allows a reroll on the Warlord Traits table. Additionally, the detachment has the Freakish Spectacle rule, which causes enemy units within 12″ of one or more units from this detachment to suffer -1 to their Leadership. Then we have the formations. First is the Grotesqueries, which consists of Urien Rakarth or 1 Haemonculus and 2 units of Grotesques. The detachment has the Freakish Spectacle rule, as well as the Latest Experiments rule, which allows the grotesques to roll on a table at the same time Warlord Traits are determined. Based on the roll, the grotesques will get +1 Strength, +1 Toughness, Fleet, Shred, Rage, or Feel No Pain (4+) for the entirety of the game. 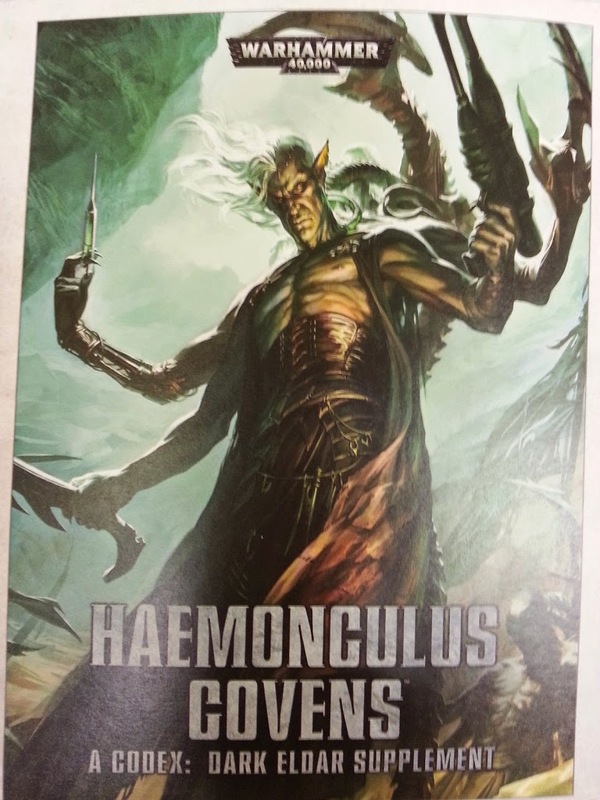 The next formation is the Scarlet Epicureans, which is a Haemonculus, a Cronos, and 2 units of Wracks. The Formation has the Freakish Spectacle rule. Additionally, Wracks from the formation within 12″ of the Haemonculus gain Precision Strikes, and always treat the turn as being 1 later for the Power From Pain table. The Scalpel Squadron is next, which is 2 units of Wracks and 2 Venoms as dedicated transports. This formation gets the standard Freakish Spectacle, and also will score D3 Victory Points if they complete First Blood, instead of just 1. The Wracks must begin the game in reserve in their Venoms, which arrive via Deep Strike on the first turn. Next is the Corpsethief Claw, which is a single unit of 5 Talos, which gain the Scout Special Rule in addition to the Freakish Spectacle rule. Additionally, this unit scores a victory point for each enemy non-vehicle unit destroyed in close combat. This is in addition to any mission specific victory points for destroying a unit. The Dark Artisan formation is next, which is a Haemonculus, a Talos, and a Cronos. The formation is fielded as a single unit and the Talos and Cronos gain a point of Weapon Skill and Initiative. The Covenite Fleshcorps is the next Formation, consisting of a Haemonculus and 3 units of Wracks with 3 Raiders as Dedicated Transports. The Wracks benefit from the Haemonculus’s Master of Pain rule if within 12″, not just if joined together. Finally is the Carnival of Pain, which is one of each of the above formations. While Urien Rakarth or the Haemonculus from the Grotesqurie formation is alive, all units benefit from the Father/Master of Pain special rule. Additionally, all non-vehicle models re-roll To Wound rolls of 1 in close combat. 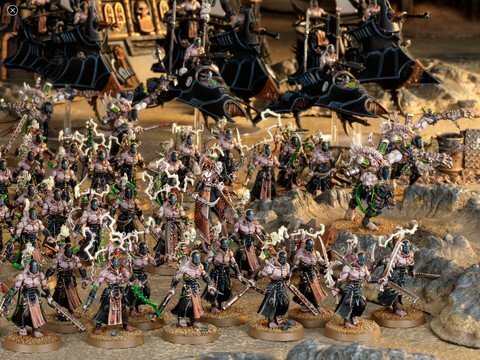 All in all, I think the supplement gives some interesting options and flexibility to a Dark Eldar army. Which formation or item intrigues you the most?